Kicking a soccer ball is the most complicated soccer skill. Unfortunately, most players never receive formal training on proper technique. They are forced to use “trial and error” to improve their kick. Learning how to kick a soccer ball through “trial and error” is difficult and takes a long time. Luckily you’ve found this article. It will teach you proper kicking technique. You will learn how to kick a soccer ball with accuracy and power. Focus on mastering each step individually then combine them into a fluid, athletic kick. This takes time, but if you focus on learning proper technique you will improve much quicker than the average player. Kicking a ball that is too close will reduce your power and accuracy. Even professional players kick the ball poorly when it’s stuck between their feet. A good touch puts the ball a few feet away from you. You should be able to kick the ball in one step. If you take multiple steps before kicking, your touch is too far in front of you. You can touch the ball with the inside, sole outside, or laces of your foot. Which touch you should use depends on the situation. How you touch the ball depends on what type of kick you use. For instance, touch the ball at a slight angle to set up a standard kick and touch the ball straight when setting up a straight kick. To improve your touch read our articles, How to Control a Soccer Ball and How to Receive a Soccer Ball. Look up quickly before kicking the ball. You will see where you are in relation to the goal and where the goalie is positioned. This step improves your accuracy. While you should usually look up before kicking, there are times when you shouldn’t pick your head up. For instance, if you are a talented forward near the top of the box you know where the goal is. Picking your head up will delay your shot unnecessarily. Whether you look up or not depends on where you are on the field, your skill level (as you gain experience, you will have better knowledge of where the goal is in relation to your position), and the pressure you face from defenders. Don’t look at the defenders or goal while kicking. Look at the ball the entire time. You will improve your accuracy and power. Where you look at the ball depends on what you want to accomplish. If you want to kick a ball with loft, target the bottom of the ball. If you want to bend the ball target the sides. For every other scenario, target the middle of the soccer ball. Looking up while kicking is a hard habit to break. Every player likes looking at their kick. But breaking the habit is worth it. You won’t get to see as much of your kick but you’ll see the ball going into the goal more often. Where you position your place foot (nonkicking foot) has a huge effect on your kick. Paying attention to where you put your place foot will improve your accuracy and the momentum of your kick (which increases power). For most kicks, put your place foot even with the ball vertically and a comfortable distance away from the ball horizontally. If you want to put loft on the ball, position your place foot wider. Point your place foot where you want the ball to go. Positioning your place foot correctly solves problems with your kick. For instance, if you kick the middle of the ball but still kick it over the goal constantly, you are positioning your place foot behind the ball (rather than even with it). To position your place foot, push off your kicking foot then move your place foot forward to the correct position. Swinging your arms fluidly while shooting improves balance and power. It makes the kick fluid and athletic. You will look better and kick better. To use your arms, raise the arm that corresponds with your place foot upward while you simultaneously move your other arm backwards. Swing your arms forward when you make contact with the ball. Your arm movement should be natural and athletic. 6. Bring back your kicking leg. Your shooting leg should create a v.
Bring your shooting leg back as far as possible. The farther you bring your shooting leg back, the more momentum you create. More momentum = more power. Record yourself kicking to ensure that you are bringing back your leg far enough. You improve with practice. Improve your flexibility if you have a hard time bringing your leg back. Think of your foot like a golf club. All golf clubs are made of metal because it’s solid. The metal doesn’t bend when striking the golf ball. Any flexibility would decrease power and accuracy. Lock your ankle so your foot becomes firm and straight. It’s simple to learn and makes a big difference. 8. Keep your body straight. Coaches often yell “learn over the ball” when a player strikes the ball over the net and “lean back” if a player doesn’t get enough loft on the ball. Leaning either way messes up your kick. It partially takes away balance and momentum. In other words, it makes kicking a soccer ball athletically more difficult. So why do coaches say to “lean forward” or “lean back”? When you lean forward you naturally put your place foot slightly in front of the ball, and when you learn backwards you naturally put your place foot behind the ball. You don’t need to lean to position your place foot. There’s no point in leaning in either direction. You can keep the ball from flying over the goal and put loft on the ball easily when you apply the proper kicking technique you learn in this article. You can lean forward or backwards slightly if it’s more comfortable but never focus on leaning a certain way. No one talks about the angle of your body. Yet, I’ve found it has a huge effect on the accuracy of your kick. When a player misses the goal by a large margin, their body is always angled away from the goal. The ball will go towards where your body is positioned. Position your body so that you are facing where you want the ball to go. Practice changing your angle to see it’s effect on accuracy. Which part of your foot should make contact with the ball depends on the type of kick. For instance, kick the ball with the inside of your foot to kick a pass on the ground and the sole of your foot to use a straight kick. Work on kicking the right part of the ball with the right part of your foot. Master this and your kicking accuracy will improve. I didn’t focus on following through for years. I didn’t think it had a huge impact on my kick. I was completely wrong. Following through greatly increases power and accuracy. If you don’t follow through, you are essentially chipping rather than kicking the ball. To follow through, continue your kick after you’ve made contact with the ball. Follow through towards your target to improve accuracy. If you want the ball to go higher, your leg should go high after you kick the ball. If you want to drive a kick your leg should follow through at a medium height and you should step forward with your kicking leg rather than lifting it into the air. Always land on your kicking foot. Follow up after shooting the ball. Most players will watch your kick so you will get to the ball first if it ricochets off the post or goalkeeper. Make a run after passing the ball. You may receive the ball back and you create space with a good run. The exceptions to the rule is when you take a shot from a long distance or pass the ball a long distance. 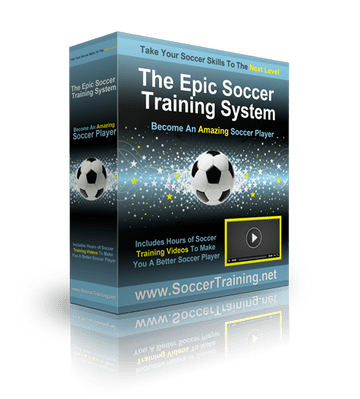 If you want to kick the ball with power and accuracy check out Epic Soccer Training. A professional player will teach you proper kicking technique. Get the free 7 day soccer guide!